What’s your favourite wine pairing? Is it a côte de boeuf with aged claret, maybe a dozen oysters with a crisp Chablis? How about crottin de Chavignol with a glass of pure Sancerre? For me there is one accompaniment that is guaranteed to make any wine taste better; it isn’t meat, fish or even a fine cheese; quite simply it’s good friends. 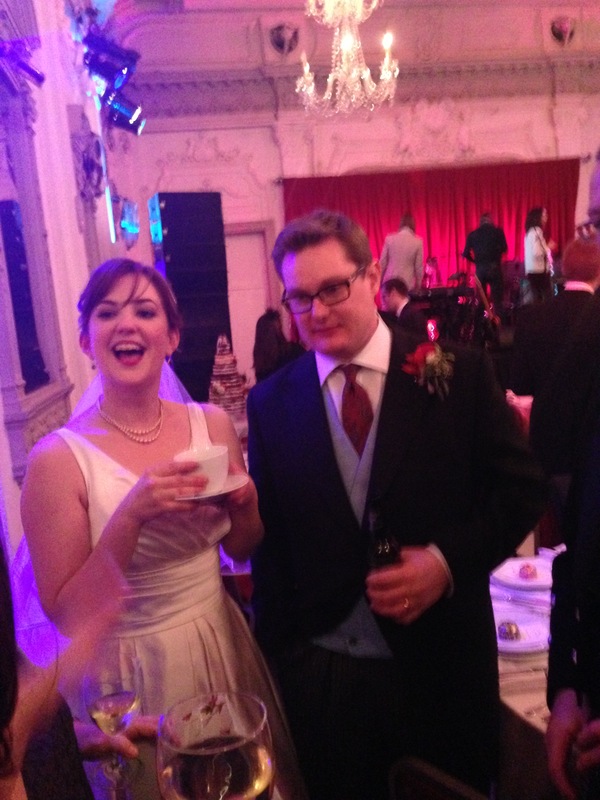 We spent a weekend in London celebrating the marriage of my ex-work colleague Hanski and her new husband George (she wasn’t replacing one!). They put on a fine affair, starting with beers and rugby in a bustling London boozer on the Friday night (don’t ask about the score). The wedding took place at a West London church that I had visited once before, not for a wedding but for something far more religious, a biodynamic wine tasting with wine producer Emmanuelle Cazes! From there we headed on a brace of Routemasters to the wonderful Bush Hall music ballroom for speeches, dinner, dancing and wine. I loved Hanski & George’s selection of Picpoul de Pinet as the white wine and grudgingly acknowledge the Argentinian Malbec wasn’t too bad either (many of you will know about my feelings towards Malbec by now). What a fun wine selection, almost as much fun as the mulled cider served in teacups on arrival! The celebrations went on into the early hours but the festivities didn’t end there as H&G had arranged a recovery lunch at George’s club, The Lansdowne, on Sunday afternoon. Fish pie, apple crumble and a few glasses of zesty New Hall English Bacchus and Berry Bros’ modestly titled ‘Good Ordinary Claret’ was a perfect end to a fantastic weekend… or so we thought. What I have failed to mention yet was the presence of a couple you may have read about previously on these pages (The day Ave & Al tried to kill us, The Haggis Challenge). Ave and Al moved to France just before Christmas and this was the first chance we had to catch up with them for quite some time. When the famous words “shall we find somewhere for another glass” were uttered, I feared the worst; these words do not form a question, they are a call to arms, and the beginning of a guaranteed hangover. I was amazed how all of the best wine haunts appeared to be closed on a Sunday in London but we were just around the corner from Barclay Square and A&A had yet set foot in Hedonism (Art Gallery for Wine Geeks, Return to Hedonism). 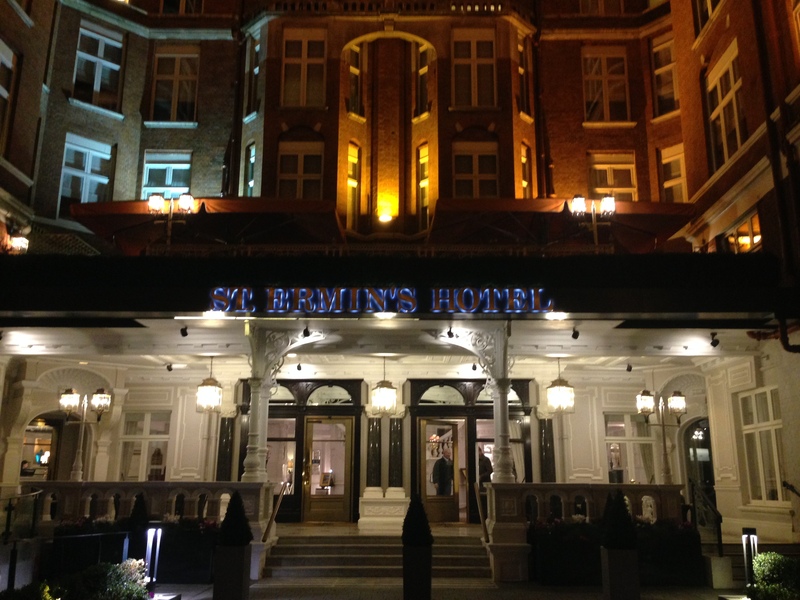 We spent an hour or so walking around the most fabulous wine shop in the world; trying a few samples from the enomatic machines before agreeing to head to the Caxton Bar at St Ermin’s hotel for a bottle and a proper catch-up. By the time the last drop of Pinot was consumed we were really only half way through catching up properly. Luckily for us, both Al and I had spotted the same bottle on the menu and there was no way we weren’t going to give this one a go. We both love Sangiovese. We both love Californian wine. But in the same bottle? Are you mad? We obviously are because we had no hesitation is ordering a bottle, the interest and intrigue was far too much for either of us to handle. And what a selection it turned out to be. Bacio Divino Wine Cellars is a small family-owned winery based in Calistoga, Napa Valley. The eponymous ‘Bacio Divino’ is a Cabernet Sauvignon blend with small amounts of Sangiovese and Petit Syrah, whereas ‘Pazzo’ is primarily Sangiovese with smaller amounts of Cabernet Sauvignon, Zinfandel, Merlot, and Viognier. The estate also produces Syrah cuvees under the ‘Vagabond’ title, Cabernet Sauvignons (including a To Kalon single vineyard bottling) with the ‘Janzen’ moniker and, most recently, Pinot Noirs bottled with the ‘Lucie’ designation. The venue may change, the wines may change, I’m so glad the friends stay the same. Posted on February 9, 2015, in Uncategorized. Bookmark the permalink. 7 Comments. 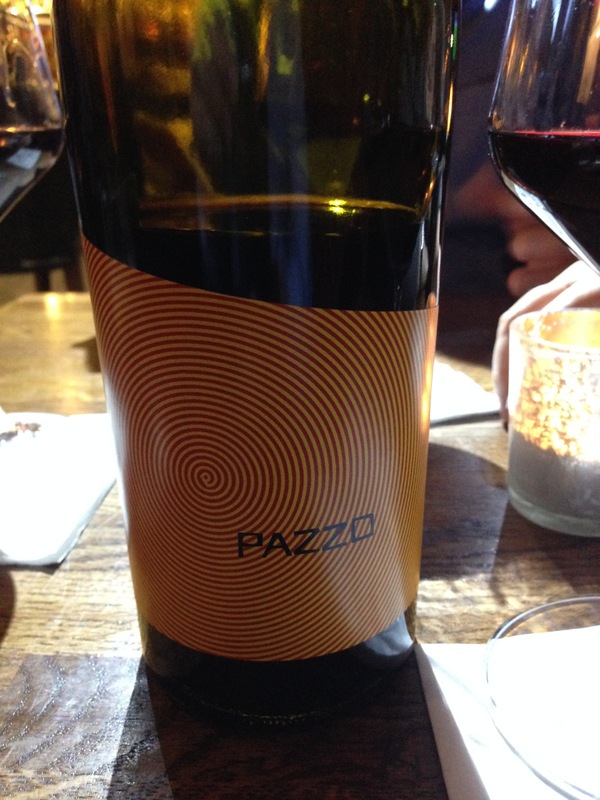 I agree with you about the Pazzo wine, which is Italian for “crazy.” I wrote about this wine some time ago and my Bride and I both enjoyed this wine. CA sangio can be good but there are a lot of boutique producers that really have no idea how to handle it. I’ve found some tasty ones in my travels throughout this state so I always try them when at a new tasting room but it can be a gamble. Another surprising one is CA barbera! I love it! I just love finding new and unexpected stuff on wine lists – you have to remember that we don’t see anywhere near enough Cali wines over in the UK, never mind ones made with Sanjo! Would love to try the Barbera – will find a stockist… perhaps!